After 25 years of welcoming climbers to our Centre, The Chamber is about to undergo major refurbishment. To say “farewell” we are running a fun comp this Easter to climb the Feature Routes. The 14 features only routes range from the easier ‘Big Pocket Wall’ at F4+ to the ‘Corner Eliminate’ at 7b and the evil ‘Yorkshire VS’ at 6c. The perfect transition /preparation to getting outdoors this Summer. How many can you do? Absolutely free (just pay usual entry), open to all ages and featuring a festive chocolate treat for all returned cards and entry into our Prize Draw. 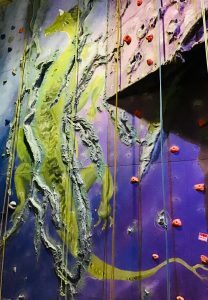 Post a picture of you climbing the features in the Chamber on instagram with the hashtag #chamberfeatures and tag @lakelandclimbingcentre for an extra entry to our Prize Draw. Win a month’s pass and more chocolate!